The gallbladder is a pear-shaped organ, connected with the common hepatic duct arising from the liver. The gallbladder stores and concentrates bile which is produced by the liver and helps in digestion of fats and certain waste products by releasing the bile into the common hepatic duct. Bile is a yellow-green liquid, composed of water, lecithin, cholesterol, bile salts, and bilirubin. Occasionally stones may develop in the gallbladder or duct due to improper ratio in the bile of cholesterol, bile salts, or bilirubin that result in blockage of the normal flow of the bile. This presents as severe pain in the upper abdomen. Furthermore, stone formation may produce gallbladder inflammation, a condition known as cholecystitis. Inflammation of the gallbladder without the presence of stone formation is called acalculous cholecystitis, and is often caused from prolonged fasting, severe illness, and several other reasons. In rare cases, gallstone formation may result in cancer development in the gallbladder and biliary ducts. Usually gallstones are unnoticeable and do not need treatment, until and unless it produces pain or discomfort. In most cases, treatment of gallstones involves surgical removal of the gallbladder which does not affect the normal physiological functioning of the body. Based on their composition, gallstones can be categorized as, cholesterol stones and pigment stones. Cholesterol stones comprise of more cholesterol and bilirubin, but less bile salts, whereas pigment stones have more bile salts, along with calcium. In addition, people with high triglyceride levels and conditions such as anemia, sickle-cell disease, thalassemia, hereditary spherocytosis, elliptocytosis, or jaundice, are at high risk of developing gallstones. Gallstones and cholecystitis (inflammation of the gall bladder) can be easily diagnosed through ultrasound. Other advanced techniques or tests include endoscopic ultrasonography, cholescintigraphy (HIDA) scan, CT scan, Endoscopic retrograde cholangiopancreatography (ERCP) as well as laparoscopic common bile duct exploration. Gallbladder surgery is considered the best option for gallstone treatment. Most people can live a normal life without their gallbladder, as gallbladder removal results in direct passing of the bile from the liver into the small intestines through ducts. 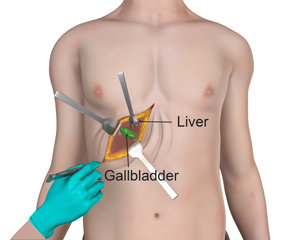 The surgery to remove the gallbladder is called a cholecystectomy and is, usually performed through laparoscopic techniques which are minimally invasive as compared to open abdominal surgery which requires a long incision. In laparoscopic gallbladder surgery, small incisions are made to insert surgical instruments, along with a laparoscope that has a light source with a camera on the end. The laparoscope helps to locate the gallbladder and tiny instruments are used to surgically remove it. Gallbladder surgery may require an overnight stay in the hospital. The major complication of gallbladder surgery is injury to the bile ducts that can result in leakage of the bile inside the body and may cause pain and infection. In cases where gallstones are present inside the bile ducts, endoscopic retrograde cholangiopancreatography (ERCP) technique can be used during gallbladder surgery. ERCP technique involves swallowing a long, flexible tube, with a light source, called an endoscope that is connected with a viewing monitor. The endoscope reaches the small intestine through the stomach and the affected duct is located by releasing a special dye. The affected duct can be cut with tiny instruments located on the endoscope, followed by capturing of the gallstones in a mesh basket that is then removed along with the endoscope. In cases of small and uncalcified gallstones, certain medications can medically dissolve the gallstones. In addition, Lithotripsy (use of shock waves) can be used to crush gallstones; this procedure is frequently used for kidney stones.